UPDATE! WE NOW HAVE A NEW, VERY LIMITED SUPPLY OF THE SCENT CHANNELING STICKS!! There will likely never be another series of these “Sticks”available again. 🙁 They are such a great tool and these “Sticks” are beautifully made, so get your order in before they are gone!! Originally, I invented the “Sticks” to assist dogs in learning to work through scent that is flowing along the underside of a table, or along a pipe, or beside a concrete curbing, or along any other number of things where the odor of a hide moves away from a source like a river flows along its bank. Teaching a dog to “go to source” when the dog encounters channeling scent is a “learned skill” in a dog. “Learned,” not because the dog cannot do it automatically (because a dog is born knowing how to work through channeling odor), but “learned” because now they have “to work to source” for you and not for themselves!! Remember, “going to source” is a gray area for your dog. They can easily do it but you need to educate the dog that it is important to ignore all that channeling odor and to “pinpoint” source. Finally, those folks that train with me know that I am staunch proponent of something I call “Repetitive Drill Training.” As “repetition is the Mother of all good dog training,” these “Sticks” offer a form of “Repetitive Drill Training” which tends to build drive and enthusiasm in a dog. And, one can do many “repetitions” in a training session with equipment such as these “Scent Channeling Sticks” without burning the dog out. The following video demonstrates this perfectly as the first few times each dog works the “Sticks,” each dog was a little “off” in their pinpointing accuracy. But, as one can see in the second session of each dog, each dog was nailing the precise location of each solitary white scented Q-tip with enthusiasm!! 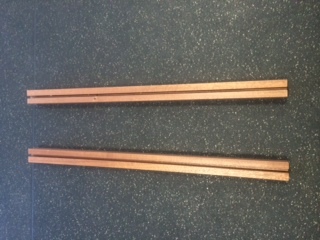 So, using “Scent Channeling Sticks” is a component of my training system and Trimitsis Woodworking has produced our second batch of these “Sticks.” Each “Scent Channeling Stick” is 31 inches long, 1 ¾ inches wide and 1 ½ inches deep. The “Sticks” come apart so that you can insert the head of a scented Q-tip into one of six holes drilled along one side of a half stick. 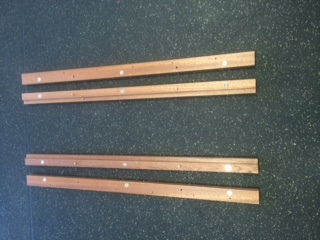 The “Sticks” are held together with magnets and pins. The price is $30 per “Stick” or $25 per “Stick” if bought in groups of three or more. Taxes (as applicable), shipping and$5.00 handling will be calculated when your order is received. At this point, payment can only be made by check. To order, please email scentinelnosework@gmail.com and we will correspond about total cost (including any taxes, shipping costs and $5.00 handling fee) along with payment instructions.